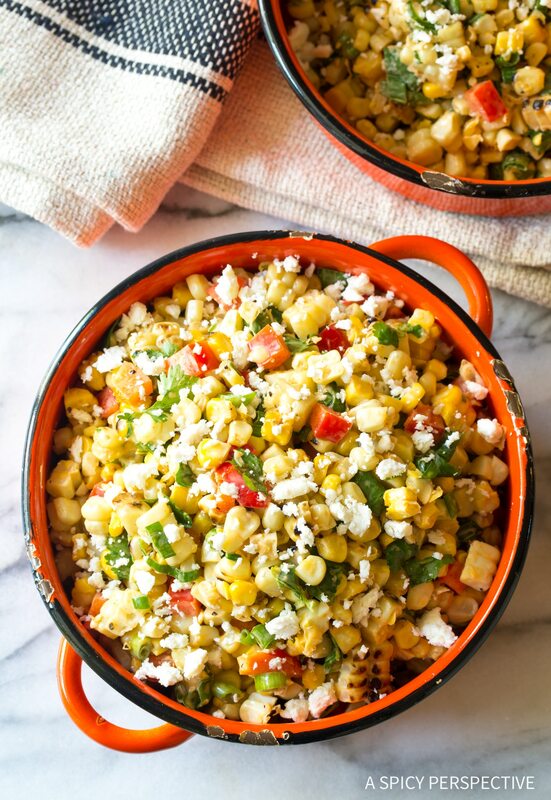 Grilled Mexican Street Corn Salad (Esquites) + Video! 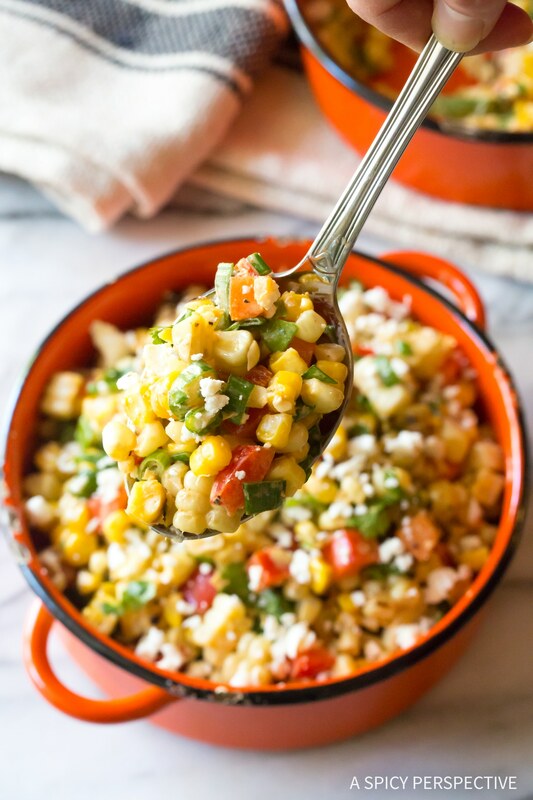 Bright zesty Grilled Mexican Street Corn Salad, a simple Esquites recipe you can make in minutes! Years ago, Lt. Dan and I used to frequent a fabulous little upscale Mexican restaurant. It was in a terrible location, and unfortunately the restaurant didn’t make it. However, the failure was not in the food. On the contrary, several of their dishes impacted my understanding of latin-American cuisine. 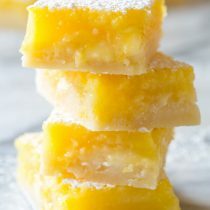 I crave them, and I have since remade them at home from memory. One particular menu item I loved to order was Mexican Esquites served in a grilled onion cup. You might have seen (or eaten) Elotes, Mexican corn on the cob, sprinkled with crumbly cheese. Well, Esquites is the off-the-cob version, usually mixed with mayonnaise, crema, and/or cheese. This simple corn dish is fresh and silky like creamed corn, with a bit of latin flair! 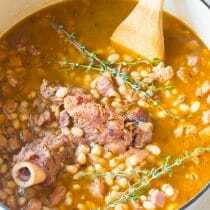 Over time, I’ve adjusted my original copycat recipe to be more of a salad, instead of a cream corn recipe… That way I can enjoy it anytime I want. 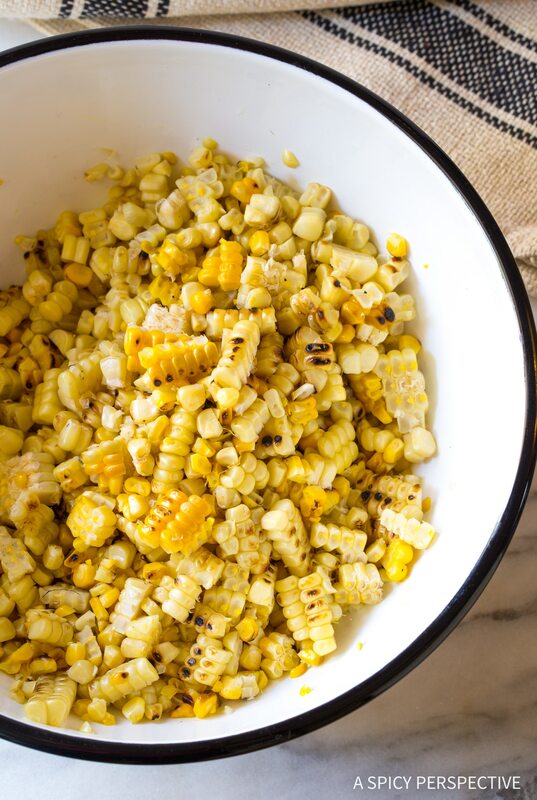 My current day version, Grilled Mexican Street Corn Salad, is light and fresh with a touch of smoky essence from the grilled corn and the smoked paprika. It’s a simple blend of grilled corn cut off the cob, red bell peppers, scallions, and cilantro. The creamy dressing is made with a little mayonnaise, fresh lime juice, and smoked paprika. Once the Grilled Mexican Street Corn Salad is tossed together, simply stir in some salty cotija cheese. Done! Our Grilled Mexican Street Corn Salad is a cross between the silkiest creamiest Esquites you’ve ever had, and classic Elotes Mexican corn on the cob. Best of all, Grilled Mexican Street Corn Salad is loved by all, and can be made several days in advance. 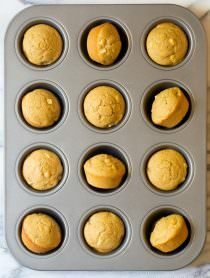 It’s a great side dish for summer picnics and parties! Mexican Street Corn Salad Recipe - This simple variation of traditional Mexican Esquites is light and fresh, with a rich pop of cotija cheese! Preheat the grill to high heat. Shuck the corn and remove any remaining silk strands. 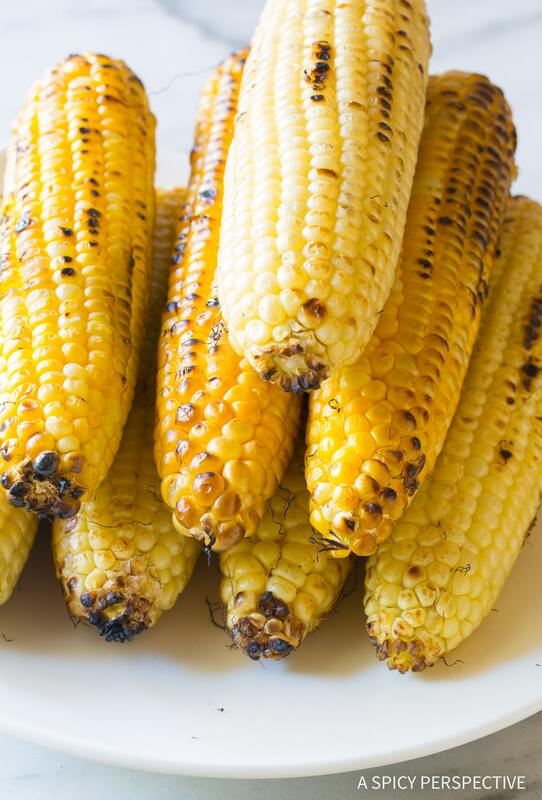 Once the grill is hot, grill the corn for about 2 minutes per side, 8 minutes total. 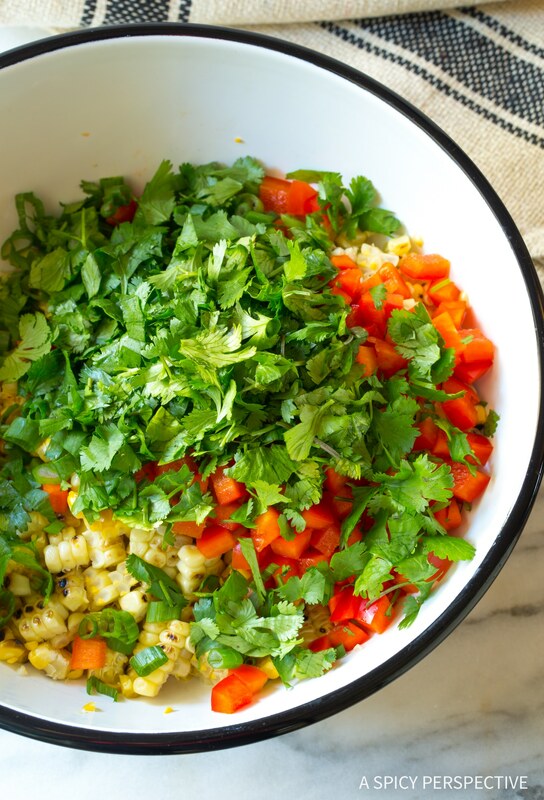 To a salad bowl, add the diced bell pepper, scallions, and cilantro to the grilled corn. Toss to mix. 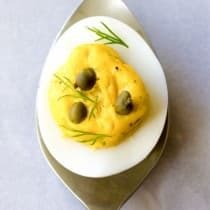 In a smaller bowl whisk the mayonnaise, lime juice and paprika together. Toss the dressing into the salad. Finally toss in the cheese, reserving a little to sprinkle on top. Taste, then salt and pepper as needed. Sprinkle cheese over the top and serve. 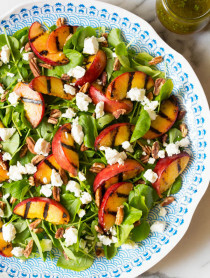 This salad can be made several days in advance. Cover and chill until ready to eat. 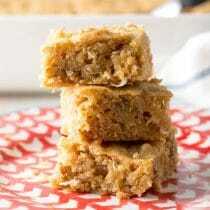 This looks so great & sounds yummy Sommer. 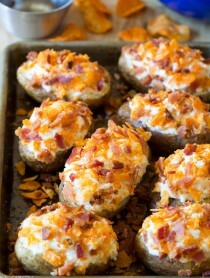 Perfect side dish for cookout and summer picnic. 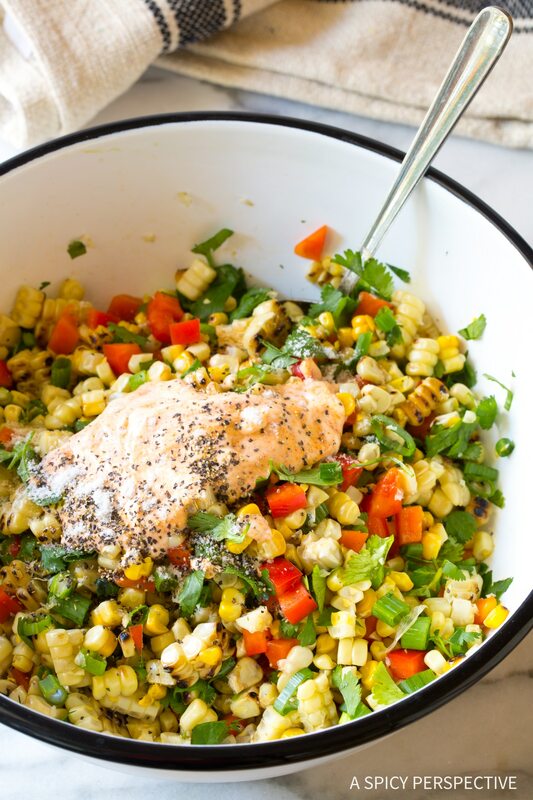 What a delicious idea for a corn salad! Can’t wait to try this one!